“Eating healthy”, to most of us, means eating exotic fruits and vegetables that are expensive, and following a diet regimen that requires a high budget. Trying to lose weight to reach your ideal body weight, and keeping your waist and hip sizes within the limit is not easy. But, here is a way to achieve your weight within a reasonable budget. It’s not that expensive! Use less meat. We are all aware that non-vegetarian food is very expensive. One can choose to add more vegetable protein sources instead, and keep meat to a minimum by eating it either once or twice a week. This will also help keep a check on cholesterol levels. Give up canned, processed, and stored foods. Get legumes and pulses which are easily available in the market. Instead of canned and stored food that contain preservatives, get soaked beans and lentils that are better for the body. They are very tasty and contain good-quality proteins. Avoid shopping when you're hungry. When you’re hungry, common sense works less efficiently, and the taste buds work more. This is a sure-fire way to end up with expensive, high-calorie extras in your shopping basket. Therefore, eat something before you leave for shopping and make sensible decisions. Try a wholesale market. Many items such as meat, vegetables, fruits, spices, and condiments are cheaper when bought in larger quantities. Buy food when in-season. Buying out-of-season fruits and vegetables often results in buying expensive, imported products that can be disappointingly tasteless. Choose recipes that make the most of what's currently in season, and enjoy the good taste and cheaper prices. Instead of spending money on chocolate and energy bars, spend it on seasonal fruits and vegetables. 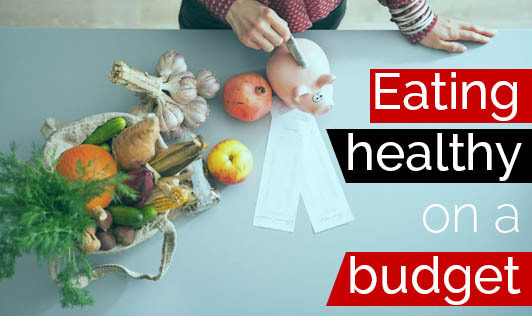 Hope these tips will help you find ways to eat healthy within a budget.